A series of lectures bringing together noted lecturers in anesthesia practice, on topics to help you review your anesthesia knowledge and to gain new knowledge and skills to enhance your practice. Lectures are delivered by practicing anesthesia dentists, and Certified Registered Nurse Anesthetists who are delivering "boots-on-the-ground" anesthesia to patients. 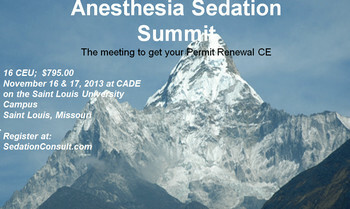 Provide you the latest anesthesia information necessary to get the CEs you need to renew your Anesthesia Sedation Permit. Anesthesia Medical Emergencies: Lecture, Airway Lab, Emergency Algorithm Practice. Refund Policy: All sales are final. If unable to attend a registered course, credit will be applied toward one of our upcoming courses.